Cody, WY (December 19, 2012) – The latest edition of the Shooter’s Bible Guide To Knives, recently released by Skyhorse Publishing, Inc., and now available for purchase, includes an exclusive interview with the American Knife & Tool Institute’s (AKTI) Executive Director Jan Billeb. Titled “The Legal Edge: What Every Knife Owner Should Know,” the interview offers perspective on the changing landscape of knife ownership across the United States, providing practical advice for knife owners and purchasers. Author Roger Eckstine, an authority on the topics of firearms and edged tools, conducted the in-depth interview with Billeb to provide readers with an informational context on knives and knife laws and their effect on the individual’s right to possess and carry edged tools. 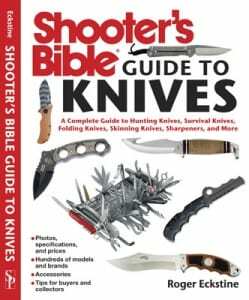 Mr. Eckstine’s interview with Billeb may be found in the print edition of the Shooter’s Bible Guide To Knives and is now on the AKTI website thanks to permission from the publisher. Providing practical advise in dealing with the legal aspects of knife ownership is an integral component of the mission of the American Knife & Tool Institute. Founded in 1998, AKTI is a non-profit organization representing the interests of the knife industry and all knife owners. Its mission is to ensure that Americans will always be able to make, buy, sell, own, carry and use knives and edged tools. AKTI is dedicated to educating knife owners on the proper use of man’s oldest tool and to providing timely, relevant information on all aspects of knife ownership.